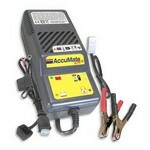 Manufacturers of Battery chargers and conditioners for over a decade TecMate features AccuMate 6-12 Volt, a versatile, 4-step, automatic charger and maintainer for all modern and classic 6 & 12V lead-acid batteries up to a capacity up to about 75Ah or the OptiMate3 SP a unique battery optimiser specially designed for all modern 12 Volt starter batteries from 2 to 32 Amp Hour capacity. Suitable for power sports and niche vehicle applications. 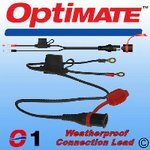 This special accessory plug lead for use with AccuMates and OptiMate III allows connection to standard car cigarette lighter sockets and also small accessory sockets fitted to some BMW, Triumph & Honda motorcycles by removing the detachable red sleeve. It also fits the matching accessory plug socket. 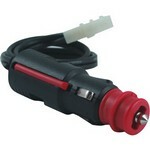 It allows easy connection of an AccuMate (or OptiMate III) to a car's cigarette lighter socket or a motorcycle's accessory socket. It is of particular use for any other vehicles where use of the standard fused permanent lead is not practical for any reason. Note – before ordering, please check that your cigarette lighter is live when the ignition is OFF. 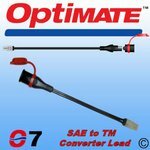 The accessory plug lead is wired for NEGATIVE EARTH vehicles – if you have a positive earth vehicle, it is necessary to rewire the plug accordingly – this is a simple job as screw terminals are used. 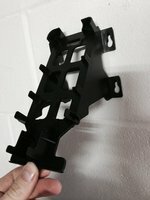 This wall mounting bracket can be used to mount the OptiMate or AccuMate on a wall or workbench. Complete with cable storage - ideal for use with the extension lead. Also fits OptiMate III but not OptiMate IIISP. NOTE: This is the original plastic wall mounted bracket, not the second version which hangs from the window. The image shown is of the product we will supply. The improved version 2 is no longer available (don't ask us why, we haven't a clue either). Pricing - apologies but due to changes in Royal Mail pricing policy we have had to increase price to cover virtually doubled shipping costs. 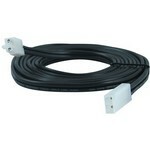 2.5 metre extension cable for use with AccuMate or OptiMate III. Suitable for pre-2015 Accumate and pre-2012 Optimate units only. 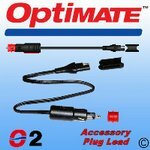 A 2.5 metre extension cable which allows the AccuMate or OptiMate to be used further from the vehicle or battery. 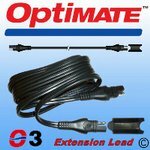 Simply plug one end into the outlet lead of the AccuMate or OptiMate and the other end into the required accessory cable (supplied with AccuMate & OptiMate).